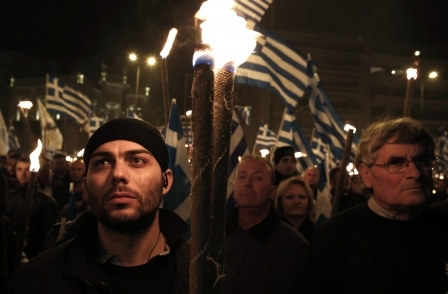 The Spectator has come under fire for publishing an article appearing to support the Greek far-right party Golden Dawn. A blog by stalwart columnist Taki Theodoracopulos – titled "A fascist takeover of Greece? We should be so lucky" – has defended the party, which won 19 seats at last year’s general election and has been widely described as a neo-Nazi organisation. Describing the group and its members as “not house-trained”, Theodoracopulos, who has written under his first name ‘Taki’ for the Spectator’s ‘High Life’ section since 1977, goes on to defend the party and its supporters. Golden Dawn has been accused of using racist and fascist iconography in its political campaigning and members have been involved in violent clashes with left-wing groups since the start of the Greek financial crisis in 2010. In the article, he goes on to describe left-wing columnists Polly Toynbee and Maureen Dowd as “old hags”.